Planning your Yosemite vacation might just be as fun as going there. Well, maybe not quite, but the key to having a great vacation in Yosemite National Park is planning right from the start. Yosemite is one of the most famous National Parks in the entire world thanks in part to the breathtaking photography of Ansel Adams. 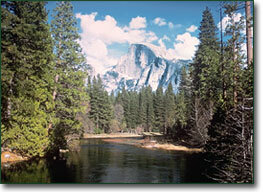 Who hasn't seen the incredible photographs of Yosemite Valley featuring Half Dome and Yosemite Falls. These are some of the most recognizable nature photos in existence. Planning your Yosemite vacation all depends on what you want to do why you are there. And there are plenty of things to do while you are on vacation. Yosemite hiking is one of the more popular things to do in the park. Yosemite boasts more than 800 miles of trails amongst some of the most spectacular landscape in the world. Make sure you have a good pair of hiking boots if you plan to take on some of these Yosemite trails, your feet will thank you. Yosemite weather will allow you to enjoy your vacation to its fullest. During the summer months in Yosemite it rarely rains. You might catch a small shower once or twice a month. However, in the winter, Yosemite can be cold and the weather can turn in a few minutes. Winter is a beautiful time in Yosemite, but you need to be fully prepared for the cold with the proper clothing and equipment. It is recommended that you don't travel more than two miles into the backcountry of Yosemite after October 31st. One of the more popular accommodations in the park is Tenaya Lodge at Yosemite. This lodge, built in 1990, is a AAA 4 diamond resort featuring an indoor pool, wireless internet access in all of its 244 guest rooms, a health club and many other amenities that will make your visit first class. Another popular accommodation in the Ahwahnee Hotel Yosemite. The hotel was opened in 1927 and is on the list of National Historic Landmarks. Ahwahnee has 123 guest rooms decorated in beautiful Native American decor. This hotel is a favorite among travellers enjoying some of the more magnificent lodges of the early part of the last century. Yosemite is a great place to vacation that you will treasure and remember for years to come. The beauty and magnificence of this natural wonder isn't easy to forget. Plan your Yosemite vacation and escape today. Here are some Yosemite maps that will help you to get better acquainted with the park.